Here we are again werewolf movie fans! This time I bring you the werewolf flicks of the 1940s, check it out. 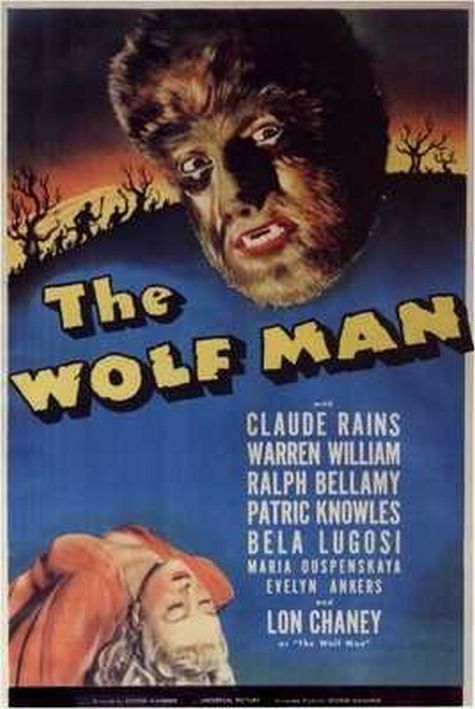 The Wolf Man: This classic is one of the best known werewolf movies out there. It follows Larry Talbot, who returns to the family estate in Wales after having spent 18 years in the United States. He is now the heir to the family estate after the death of his older brother John. Larry soon falls for a local girl named Gwen Conliff, and one evening while walking her and her friend home he is bitten by a wolf, a wolf that turns him into a werewolf. The Mad Monster: About a crazy scientist, Dr. Cameron, who has successfully created a serum which will turn a man into a wolf-like monster. Planning revenge against the colleagues that rejected him, Dr. Cameron uses the serum on his gardener Petro and each of the men are killed by his creation. His daughter grows suspicious and confides with newspaper reporter Tom Gregory. The Undying Monster: About the Hammond family and the werewolf that hunts them. It seems like just a coincidence at first, but the investigating Inspector soon finds out that this tradition has gone on for generations. Trying to find a link between the werewolf and the family he comes to a frightening conclusion. Frankenstein Meets the Wolf Man: The Wolf Man is wakened from his tomb, and yearning for death sets out to find Dr Frankenstein. Instead, he finds himself face to face with his monster. Le Loup des Malveneur: English title “The Wolf of the Malveneurs.” About a young governess who arrives at the Castle of the Malveneurs and begins to investigate some strange disappearances. The Return of the Vampire: In 1918, an English family are terrorized by a vampire, but they eventually but a stop to it. Things are going well until German bombs in WWII free the monster. The vampire reclaims the soul of his wolfman ex-servant, and assuming the identity of a scientist, he seeks out his revenge upon the family. Idle Roomers: A three stooges movie! The boys are working as bellboys in a large hotel when a side show promoter shows up with Lupe, a wild wolfman who promptly escapes. Cry of the Werewolf: A film about a werewolf woman raised by gypsies who kills everyone that knows about her. House of Frankenstein: A monster mash-up featuring Count Dracula, the Wolf Man and the Frankenstein monster, who are all brought back to extract revenge. House of Dracula: Dracula goes to Dr. Edelman’s office asking the doctor for a cure to his vampirism. However, this is a ploy by Dracula to get near Dr. Edelman’s beautiful female assistant. Meanwhile, the Wolfman arrives seeking a cure for his lycanthropy. When Dr. Edelman’s attempt fails, the Wolfman tries to commit suicide by jumping off a cliff, but instead finds a network of underground caves that hold Frankenstein’s Monster. She-Wolf of London: London is plagued by a series of grisly murders. Suspicion falls on a beautiful young woman who is rumored to have werewolves in her family tree. Bud Abbott and Lou Costello Meet Frankenstein: About two freight handlers who find themselves encountering Dracula, the Frankenstein Monster and the Wolf Man.